Polito, Frank Anthony. 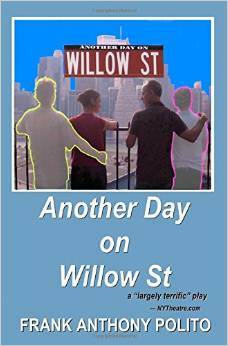 “Another Day on Willow St: a Play”, Woodward Avenue Books, 2015. Ian Brown is married to Stacy Gold and he is eight months pregnant. She worries about whether she and husband will maintain intimacy after the child is born. Mark Gray is an actor looking for that big break and he and his lover, Paul Green, who lives in Boston, have been in a long distance relationship for some six months. Mark, like Ian and Stacy live on Willow Street in Brooklyn. Paul’s mom is nearing the end of her days and her dying wish is to see Mark and Paul married. Under the right conditions, this would have been perfect but Mark has never come out to his parents nor has he ever been in a committed relationship. Both couples are afraid of losing what they have. By coincidence Mark and Stacy meet and become friends. As the two talk we see Stacy’s frustrations with Ian’s work and we feel Mark’s pressure to come out. Both Mark and Stacy begin to see that they are partially at fault for the way they feel and they begin to help each other deal with the issues and each learns to shoulder his/her own blame. We see that it is all about compromise and that both of them have to act before it is too late and they lose what they love. Sometime we seem to forget that relationships are built on giving and taking. Polito reminds us that communication as well as disappointments is important to any coming together and as we laugh and tear up as we read, we understand that we might just be seeing something of ourselves in the characters. The play is set two weeks before the terrorist attacks of 9/11 when some of us did not yet fully realize the importance of love and being together. Not that any of this was unimportant before the attacks; it just seems to be really important when we know that the world is about to be changed forever.